Rub some waxed paper over the metal runners of your baby's high-chair tray a few times, and the tray will slide on and off much easier. Rub the metal runners on your baby's crib with wax paper as well, and you will be able to raise and lower the crib sides noiselessly. 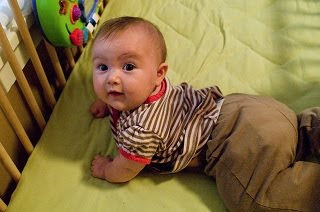 Rub zippers on baby's clothing with wax paper for easier zipping. Thanks to Charlene for this Frugal Baby Tip!